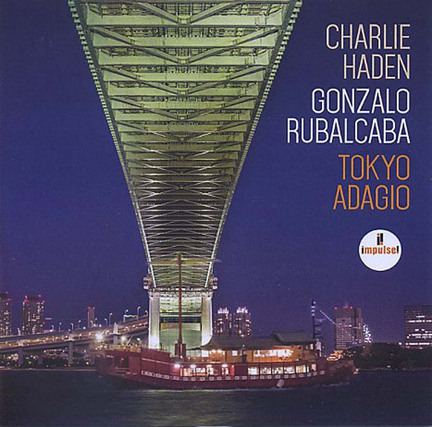 If you’re ever inclined to wonder what Bill Evans’ 1961 Village Vanguard recordings might have sounded like sans Paul Motian’s drums, this live set by bassist Charlie Haden and pianist Gonzalo Rubalcaba, recorded at the Blue Note in Tokyo in 2005, provides one possibility. Bass and piano is a challenging duet set-up, but opener “En La Orilla Del Mundo (The Edge of the World)” serves immediate notice that two masters have entered forth in dialogue. Haden solos with a quiet placidity suggestive of warm wind in low grass, for apparently the edge of this world is one of gentle climes. There is swing here, but it is a swing of sounds germinating at their ease. The version of David Raksin and Johnny Mercer’s “My Love and I” highlights Haden’s impeccable control. He hears well and has the confidence to let each note suggest the next, even when they’re spaced apart as if he were channeling the ethos of Ahmad Jamal. Rubalcaba’s recourse, then, is to create precise trilling figures that move the song forward as Haden simultaneously leaves it hanging in space. The cover of Ornette Coleman’s “When Will the Blues Leave” seems to ask and answer its own query: after the first movement, let us say, when bass and piano commence a kind of lock-step reel. Haden’s own “Sandino” has some of the lowest, most sonorous bass notes on the album, with rich, ringing chords emanating outward, indicative of the dappling that warms this entire set.